The Goshen Department of Stormwater Management was established by Ordinance 4295 in May of 2005, in order to comply with the requirements of Indiana’s stormwater general permit rule, also known as Rule 13, which was put in place to comply with the Phase II requirements of the National Pollutant Discharge Elimination System (NPDES) program, which is part of the Clean Water Act. Jason Kauffman is the City’s Stormwater Coordinator and works to manage the City's Municipal Separate Storm Sewer System (MS4) program. If you have a question or concern you can reach him at 574-537-3832 or jasonkauffman@goshencity.com. Dustin Sailor serves as the City’s Stormwater Superintendent and as the City’s Utility Engineer. 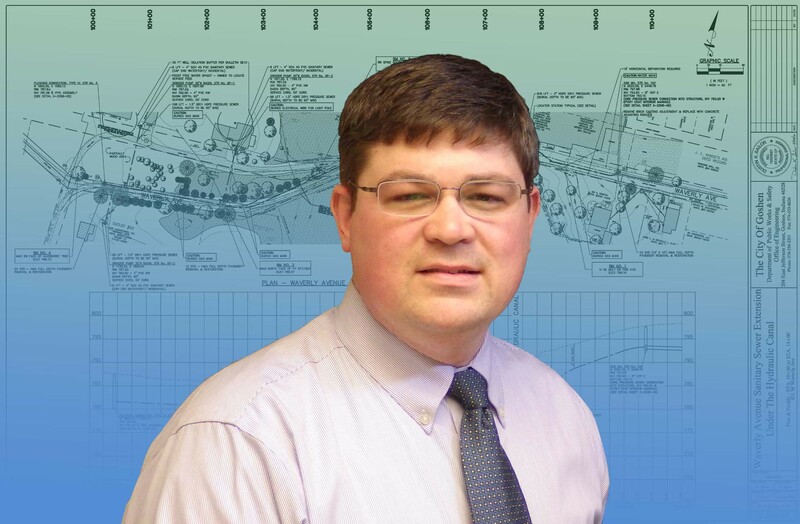 His efforts go towards planning, design, and management of construction project dealing with stormwater and utility infrastructure throughout the City. This department is overseen by a three-member Board of Directors who are Mayor Jeremy Stutsman, Mitchell Day, and Michael Landis. The meetings of the Stormwater Management Board are held in conjunction with the Goshen Board of Public Works and Safety meetings, which are typically held every Monday at 2:00 p.m. in the City Court Room/Council Chambers at the Goshen Police & Court Building located at 111 East Jefferson Street, Goshen, Indiana. The Goshen Department of Stormwater Management is located at 204 East Jefferson Street, which is on the southeast corner of the Jefferson and 5th Streets intersection, in the building that used to be Goshen High School. Why does Goshen need a Department of Stormwater Management? The Environmental Protection Agency (EPA) now considers pollution contained in stormwater runoff to be one of the most significant sources of contamination in our nation’s waterways. To help reduce stormwater pollution, the EPA, in 1990, established rules to ensure that larger cities create programs, policies, and rules at the local level to minimize stormwater pollution. In the late 1990s the EPA applied these stormwater rules nationwide to communities like ours and other densely populated areas. Thus, the primary role of the Stormwater Management Department is to ensure that the City of Goshen identifies pollutant sources and develops and implements plans to eliminate or minimize the impacts of these pollutants. Additionally, the Stormwater Management Department strives to lessen the impact of stormwater on our local groundwater resources, streams, and rivers. By doing these things the Department of Stormwater Management ensures that the City of Goshen is meeting state and federal stormwater requirements. How is the Department of Stormwater Management paid for? The budget for the Department of Stormwater Management comes from a semi-annual fee added to all property tax bills. All residential parcels pay $15.00 per year to support the program and non-residential parcels pay $15.00 per 3,600 square feet of impervious surface (hard surface areas that won't absorb stormwater such as driveways, rooftops, and sidewalks). The City's authority for collecting this fee is found in Resolution 2006-1, Ordinance 4624, and Ordinance 4712. The City of Goshen is not the only MS4 community in Elkhart County. The Town of Bristol, City of Elkhart, and Elkhart County are also identified as MS4 communities. Together these communities decided to enter into a cooperative agreement to coordinate MS4 activities throughout Elkhart County and formed the Greater Elkhart County Stormwater Partnership in May 2005. To work towards the primary goal of clean water for everyone. For more information on the Greater Elkhart County Stormwater Partnership visit their website at www.stormwaterelkco.org or call John Heiliger, Partnership Stormwater Coordinator, at 574-971-4678.